Please don’t avoid the film because of my review. I never want anyone to not see a film they were going to see because of my critique. What I wish to do is to just make their viewing more informed. So the reader understands a bit more of what they saw. You might like the film. There is no doubt it is a gripping subject. But everyone should understand what the screenwriter did. Well done, Jim. You’ve spared me about fifteen bucks minimum, as the film opened today here in North Atlanta and I’d planned for a couple of us to see it until I read your study and review. I expect the movie would have annoyed and disappointed me in much same way as it did you, and of course I respect your scholarship, your opinion, and your sense of humor even in grim matters. You’re right about Day-Lewis’s portrait of Lincoln. Frankly Paul Winfield’s portrayal of King also really has stuck with me although I agree that Mann’s production (which I seem to recall was based on Anthony Lewis’s rather broad bio of MLK), was too superficially stagey and televisual, both. With you, we here want to see a cinematic treatment of King that’s worthy of its subject. He probably was the one really great World personality this country produced in the second half of the century past. I see no reason why a major production limning him couldn’t be as acute and sharp as was Spike Lee’s and Denzell Washington’s depiction of Malcolm. That was a damn intelligent script, despite the hokey, elegiac, denouement–which however somehow made sense, just as it made sense for Spielberg to have screened fully three denouements for “Schindler’s List”, the Neverending Ending of hyper-screenwriting. Lee made such an indulgence work and so did Spielberg do. I think they both aimed for a close that was cathartic and redemptive, but perquisite of such a gesture is a film sufficiently vivid and intense that the audience wants to decompress before exiting the movie house or changing the channel. Obviously, “Selma” is not such a film. That’s too bad. An MLK bio-flick could be so salutary right now. Obviously you, as an historical researcher and storyteller can understand the great problem of figuring out how to delimit the subject, the timeframe, even though MLK’s working career was so relatively too brief, if crowded. This instinct for delimitation was half the genius of the film “Lincoln”, and the sweeping, encompassing alternative biographical strategy was more than half of what has made earlier treatments of King so wooden. Too much of a good thing. 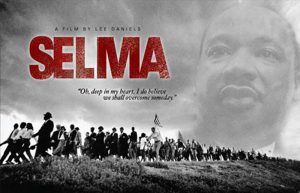 As a big fan of Mr. DiEugenio’s work, I especially appreciate his detailed review of “Selma”. I will make two brief points about the film’s characterizations of two supporting characters, LBJ and J. Edgar Hoover. 1. It is largely from Mr. DiEugenio’s work in other fora that I know about the concerted effort in recent years to pin the blame for the JFK assassination on LBJ. This propaganda campaign is aimed at people who are well enough informed to dismiss the Official Lone Nut/Magic Bullet Fantasy as palpably untrue, but who are not motivated enough to do more than browse a few articles on the topic. Bolstering this campaign are recent books and films which have portrayed LBJ with extra enhanced sinister overtones. 2. I don’t pretend to understand a second meme except as an example of the general sanitizing of history in line with current politically correct attitudes. I refer to the movement to rehabilitate J. Edgar Hoover in the hearts and minds of the public. In “Selma”, we are told to forget what Hoover actually looked like. In the 2011 film “J. Edgar”, witness Hoover as a handsome (until the older Hoover was made to resemble Marlon Brando), internally conflicted, closeted gay. A web search on Hoover turns up such articles as the rather flattering “Five myths about J. Edgar Hoover” from the Washington Post. COINTELPRO? Never heard of it. I wonder if anyone will ever make a film called “Memphis” about the 1968 assassination of MLK, which will conclude with the 1999 jury trial that found Loyd Jowers and “and other unknown co-conspirators” (some of them from US government agencies) responsible for the shooting death of Martin Luther King Jr.
You are exactly right about the softening image of Hoover in the latter years. First Eastwood and now this. LBJ did a lot of reversals of Kennedy’s policies, but this was not one of them. Just look at that speech of his I linked to. I don’t think we disagree at all on this point. My reference was to the way LBJ was portrayed in Selma (and elsewhere nowadays), not the way in which he pursued Kennedy’s intentions concerning civil rights legislation. I don’t recall hearing you comment on the speculation that perhaps in this one area of civil rights legislation, that not only did LBJ “continyah” with Kennedy’s intentions, but that as a white Southerner, he may have had more success than Kennedy would have had in a second term. Any thoughts on that? With the Voting Rights Act, that might be true. But the Selma demonstration was pretty effective. Its pretty hard to argue with LBJ’s domestic legislation I think. And the fact he was from the south may have helped him get some votes JFK would not have. But as per his reversals of Kennedy’s foreign policy, that was just about uniformly terrible. I don’t believe that the film showed a cheap shot against LBJ. It is a fact that both Dr. King and LBJ disagreed on tactics. People can disagree with parts the film, but the director has great sincerity. Joseph A. Califano Jr., is totally wrong. LBJ and J. Edgar Hoover were close friends (as shown on tapes throughout the 1960â€™s). LBJ did nothing to stop Hoover from monitoring civil rights activists illegally (when Johnson knew what the FBI was doing), but LBJ did not authorize these types of wiretaps (during the Selma period). People in the civil rights movement (not LBJ) organized and invented the Selma protest movement. Joseph Califano Jr. is a notorious apologist for LBJ. I have heard of him and his statements before. Califano is desperate. The truth is that Lyndon Johnson expanded the Vietnam War (he allowed napalm, herbicides, white white phosphorus, etc. to be used in Vietnam. More bombs were dropped in Vietnam than all U.S. bombs dropped during WWII. Vietnamese people were forced into camps) and executed other imperialist policies throughout the Earth. LBJ supported the CIA’s illegal Operation Chaos program, which allowed the CIA to illegal monitor anti-war protesters in America. LBJ is known for using racist slurs. Dr. Martin Luther King Jr. and Malcolm X converged on numerous views. Each agreed to oppose the Vietnam War, they opposed the viciousness of poverty, they disagreed with imperialism, and both offer criticisms of capitalism. Malcolm X became more progressive by 1965 and he supported Dr. King’s efforts in fighting for voting rights in Selma. He supported an Western-backed invasion of the Dominican Republic. Lyndon Johnson was right to sign the Civil Rights Act and the Voting Rights Act, but he was not God. LBJ passed many progressive legislation dealing with poverty, the environment, etc. He was a complex, crafty politician who knew that he had to do certain things as a means to deal with his Presidential legacy. Black people have strong leadership in the overall black freedom struggle. Black people were organizing in Selma, Alabama years before Dr. King met with Johnson. Lyndon Johnson disagreed with Dr. King on the tactics in fighting against white racist terrorism. Activists pushed Lyndon Johnson to be more revolutionary on civil rights issues. Selma was not LBJâ€™s idea, which is a lie. Joseph is wrong. Sister Amelia Boynton was definitely a leader of the Selma voting rights campaign. It most surely did deliver a chap shot against LBJ. When did I quote Califano in my review? I quoted KIng’s leading biographers, namely Branch and Garrow. Also the Church Committee report. Those are the best sources on what Hoover did to King, and what LBJ’s true role was. He was not an obstructonist in Selma. And he had nothing to do with the suicide package. She did not perform a cheap shot. She just did not want to deify him. In retrospect, I wished she clarified the relationship between MLK and LBJ better. I only concede that to you. LBJ was a notorious imperialist and a racist point blank period. I agree with him passing progressive legislation and no one can take that away from him, but he was what he was. There can be critiques of the film, but he wanted the Voting Rights Act to be passed as a means to supplement his legacy. You can’t find a single syllable where I said that LBJ authorized Hoover to illegally monitor Dr. King. LBJ did nothing authorize those wiretaps. Yet, LBJ and Hoover were well known friends. That is a fact. LBJ could of easily stopped Hoover from doing that via his executive power. On tapes, LBJ praised Hoover all of the time. LBJ supported the illegal CIA Operation Chaos program. The reason I did a brief biography of KIng was to show how he was not interested at first in even attending a meeting about the Montgomery boycott. How he then was reluctantly pulled into being the leader of the SCLC. Secondly, I did mention other groups who had been working in the area like DCVL and SNCC. I also noted their opposition to King and its also depicted in the film. Whatever one thinks of King, the Kennedys, or Malcolm or LBJ, it was that constellation that broke the back of segregation and voting rights discrimination in the south. That does not mean of course that no one else deserves credit e.g. Dianne Nash sure does. But God knows how long it would have taken without them. One reason this is such a good site is that it recognizes those kinds of inescapable facts. Folks, if you haven’t read Charles Payne’s “I’ve Got The Light of Freedom,” if all you know is Emmett Till, and Rosa Parks, and Martin King, and “I have a dream,” you’re missing out. Get the updated edition. I never cease to be amazed as to how little of the facts and emotions of the Civil Rights movement, of the Viet Nam era, heck of most everything from the fifties and sixties, and early seventies seems to have been either forgotten or never learned in the first place. And most information that is currently generally available is as a sound bite, a headline, a single cynical off the cuff remark by some self-aggrandizing pundit. I fear that most folk roughly 50 years old and younger will never get an appreciation for the spirit and intensity of those times, or quite understand the cultural revolution this nation was painfully experiencing. ” There was never, for me as teacher and writer, an obsession with “objectivity,” which I considered neither possible nor desirable. I understood early that what is presented as “history” or as “news” is inevitably a selection out of an infinite amount of information, and that what is selected depends on what the selector thinks is important. “I was relieved when I decided that keeping one’s judgments out of historical narrative was impossible, because I had already determined that I would never do that. I had grown up amidst poverty, had been in a war, had witnessed the ugliness of race hatred, and I was not going to pretend to neutrality. I agree strongly with the comments of Aime Duclos and Vivek Jain. I would like to share an observation that I have made about history textbooks used in American high schools and colleges. It appears that all are published by for-profit corporations. No anticapitalist organizations and no labor unions publish history textbooks. For that reason, we learn our history the way the ruling class, which owns these corporations, would wish us to learn it. When the generation of the 60s is dead and buried, they will be either villainized or forgotten. The threat that they posed to the ruling class and their experimentation with different lifestyles and political-social arrangements (remember the communes?) will be forgotten. The now-emasculated Voting Rights Act will be portrayed as a gift from kindly white people to long-suffering Negroes. The tremendous upheavals of the time will be swept under the rug. The antiwar movement and the remarkable reporting of the briefly flourishing underground press will be ignored. By the way, the same thing has already happened with the labor movement up through WWII. America’s leftwing movements of the past, which were far more powerful than anything we have at the present, will all be flushed down the memory hole, much to the benefit of the ruling class.